Digital Surrogates from the Gizz Kids/Ms Kids Wheel Chair Basketball Teams File, 1948-1986, contain correspondence; newspaper clippings; press releases; events schedules, programs and itineraries; biographies and rosters, concerning the Gizz Kids/Ms Kids Wheel Chair Basketball Teams history, activities, development, achievements, wheel chair sports rules, and accessibility issues at UIUC and other locations hosting sports events. Digitized materials also include information related with other sport teams for students with disabilities. Major correspondents include Timothy J. Nugent (Counselor of rehabilitation), C.C. Loew (Superintendent of Schools) and Major General Leo M. Boyle, Adjutant General. 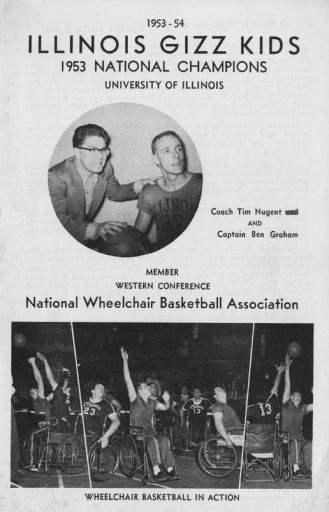 The Gizz Kids/Ms Kids Wheel Chair Basketball Teams File (Digital Surrogates), 1948-1986 are managed by the University of Illinois Archives and do not feature precise descriptive information for each item. Discover their contents by browsing the folders and files. For more information, contact an archivist at illiarch@illinois.edu.